NJ1 serisi kompakt makineleri hedef alan lojik sırası ve hareket kontrolü için yeni Sysmac kontrolördür. Note: Power supply units for the CJ Series cannot be used as a power supply for a CPU rack of the NJ System or as a power supply for an expansion rack. CPU rack: 10 units max. Note: The end cover unit CJ1W-TER01 is included with the CPU unit. Note: MIL = Connector according to MIL-C-83503 (compatible with DIN 41651/IEC 60603-1). Note: The data transfer function using intelligent I/O commands can not be used. Note: Mount to the right of the power supply unit. 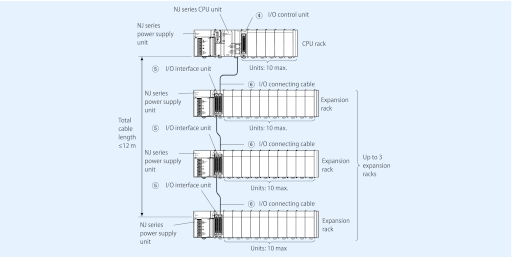 Connects an I/O control unit on NJ series CPU rack to an I/O interface unit on a NJ series expansion rack. Connects an I/O interface unit on NJ series expansion rack to an I/O interface unit on another NJ series expansion rack. Note 1. Please do not connect EtherCAT junction slave with OMRON position control unit, Model CJ1W-NC_81/_82. 2. 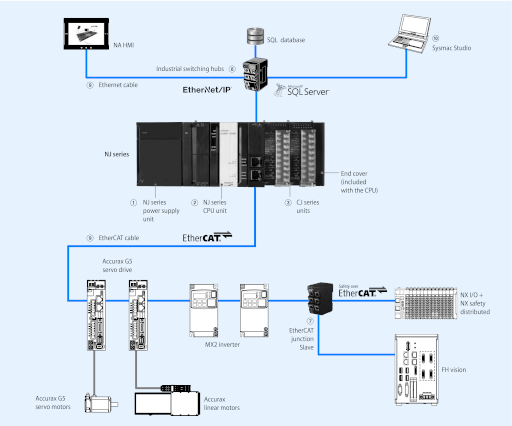 EtherCAT junction slave cannot be used for Ethernet/IP and Ethernet. Quality of Service (QoS): EtherNet/IP control data priority. Note: Please be careful while cable processing, for EtherCAT, connectors on both ends should be shield connected and for EtherNet/IP, connectors on only one end should be shield connected. Note: Special versions are available for USA, Canada, China and Japan. Sysmac Studio konfigürasyon, programlama, simülasyon ve izleme için bir tasarım ve çalışma ortamı sağlar.